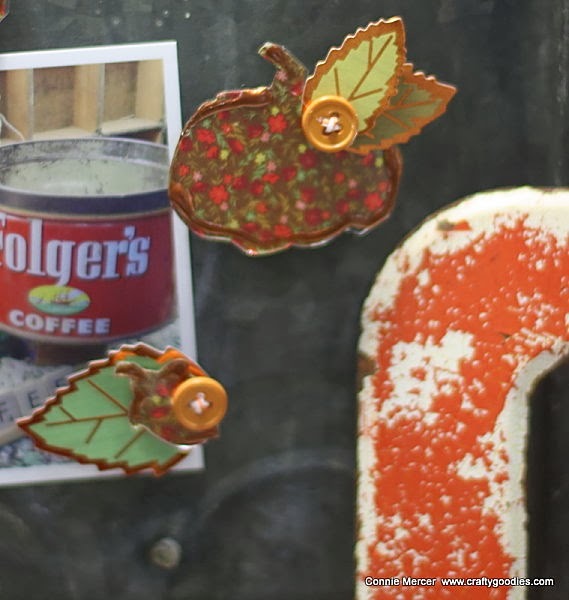 crafty goodies: Clear Scraps~Fall magnets! I'm up over on Clear Scraps with a very cute and easy project. It all came about because I wanted some "Falllish" magnets for my kitchen. You remember the old refrigerator door, right? Well that is why I made them. You can see my post on Clear Scraps Blog. My mom is visiting and we have been junkin'~can't wait to show you some great finds. I have a couple re-purposed items to show you, I just need to take pictures. Labels: acrylic, Clear Scraps, pumpkins, S.e.i. Cute, Connie. That would be nice for the Christmas lists the kids give me. We hang them on the refrigerator. I hope you and your mom have a wonderful time visiting. Sweet - off to check!